Just wanted to THANK each and every one of you who follow and read my blog! And to show my appreciation for you, I've decided to buy one of my lovely readers a cup of coffee or three? Congrats on hitting 200! I'm just hitting 140 so I'm looking forward to 200. Congrats on hitting 200 followers! I just hit 200 too and it feels great :) Thanks so much for having this giveaway, that's so nice of you! Whoah! Starbucks?! Saweet! Sure hope I win! I gave you a shout out in today's blog. I'll give another one in a couple of days! Thanks Whitney! And good luck!! Congrats on hitting this milestone! Congrats on the followers! That is wonderful! oh how i love starbucks! check out my giveaway for a 250x250 ad space for 60 days! 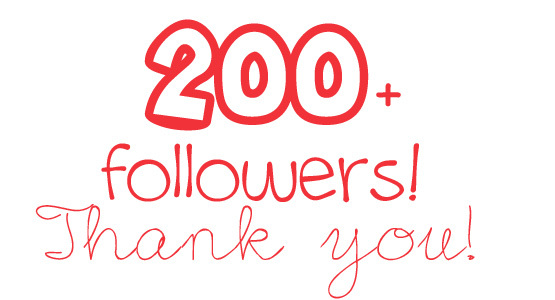 Awesome to your 200+ followers!! Thanks for stopping by and following. Returning the favor. Have a great week!